1. Do you waste time and money coordinating between your CPA, payroll company, and Bookkeeping software? 2. Do you suffer through inefficiency because of “Silos” between your bookkeeping, tax planning, and payroll? 3. Is your bookkeeping kept to high accounting standards, or are they kind of a mess? This summer my parent’s large, beautiful Linden tree died for some reason. It stands 50 feet high in their front yard and has provided wonderful shade for their front porch since we moved to Lakeville in 1998. Now my Dad is the type of person who isn’t afraid to conquer chores and projects at home, and His time growing up on the farm embedded a fairly rugged spirit in terms of danger. When it comes to felling a 50 foot tree, in cramped suburban quarters, He has some reservations. His trepidation might be due to age, or maybe because He’s watched too many “Epic Fail” videos on Youtube teaching us to take caution when felling trees, jumping on trampolines, using a door mounted pull-up bar, or jumping into pools. Regardless of why, He wanted to investigate what it would involve for a qualified company to remove the tree. He called a local Minnesota Tree Care and Removal company which came out and gave Him an estimate for the tree removal. The quote was reasonable, except that it didn’t really solve his entire problem. The company’s quote included the tree removal but they told my Dad He would have to move the rock away from the tree before they could do their work. Remove the rock from the tree? That alone, is probably 1/3rd of the effort included in the entire project because there is a HUGE boulder and a couple tons of large decorative rocks around this tree; a Skidster tractor is required. Instead of efficiently providing an “end to end solution”, my dad now has to find ANOTHER company to bring out a skidster, move the rocks. After the tree company does its job, He’d have to get the rocks moved BACK into place. Coordinating their work will definitely be frustrating, cost additional money, and waste His precious time which could be spent with his granddaughters! My Dad has been scratching his head as to why the tree removal company wouldn’t ask for even MORE of His money and remove the rock as well; providing a seamless solution to his problems. But instead, my Dad will end up coordinating two companies to work with each other, inevitably costing more time and money. Could there be a better solution? This reminds me of the situation many small business owners find themselves in before they work with Nuance Tax & Accounting. One company is doing their bookkeeping, another their payroll, and their CPA serves an entire other function. Or perhaps they use their QuickBooks for invoicing only, the bookkeeping is a mess, and payroll is simply the way they issue 1099’s at the end of the year to their sub-contractors. No matter the scope, business owners end up with low-integrity bookkeeping, no pro-active tax planning, and payroll compliance laws being broken or sidestepped. Worst of all, it’s just inconvenient. 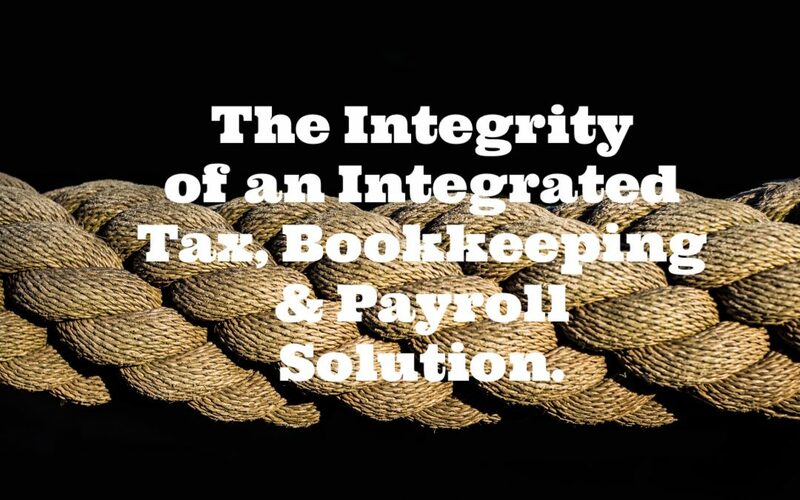 You could make the analogy that having competent, integrated, bookkeeping, tax planning, payroll, and consulting is different like having a triple-braided cord rather than three single strands. There’s much more integrity in the braided cord rather than the single strands together. Because most companies don’t have a one-stop-shop for their accounting, bookkeeping, tax returns, tax planning, payroll and consulting; they waste time and money, getting a sub-par outcome. When one company can competently handle the QuickBooks accounting, bookkeeping, payroll, tax returns, tax planning, and strategic tax mitigation, the customer can enjoy a single point of contact. We’ve developed our company so that we’re not your typical CPA firm which might use dated hourly billing, non-cloud-based software, or reactionary tax advice. Instead, we serve as an outsourced accountant that takes care of ensuring all of your taxes are paid on time, you’re paperwork is filed, your accounting is rock-solid, the bookkeeping is always up-to-date, and the energy you spend in all these functions is minimal. We’ve found that as we do a company’s weekly bookkeeping in QuickBooks Online, we will be intimately familiar with their operations which gives us with the knowledge to provide precise, informed, tax planning strategies which ensure they pay their fair share in taxes, and not a penny more. Do you like the idea of having one, integrated solution for your corporate tax returns, QuickBooks bookkeeping, payroll, and accounting? Do you like the idea of a team working throughout the year to ensure you’ve implemented every strategy possible to mitigate and reduce your taxes? Do you like the idea of working with a CPA, accountant, and business consultant that’s committed to earning your business every month by being competent, trustworthy, enjoyable, and rigorous? Then connect with us and see if we might be a fit! Call Rob Satrom at 952-200-8073 or email at Rsatrom@nuancefinancial.com and we can visit at our Lakeville office or at any location in the Twin Cities region.